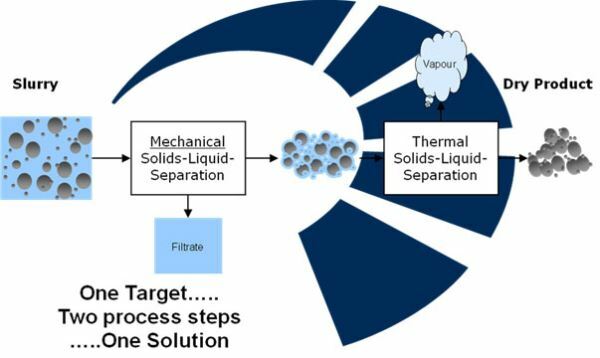 As to the production of dry bulk materials which are produced after reaction, crystallisation or precipitation in suspensions, a combination consisting of a mechanical separating stage followed by a thermal separating stage will represent for almost all applications the best possible solution in consideration of product quality and economy. 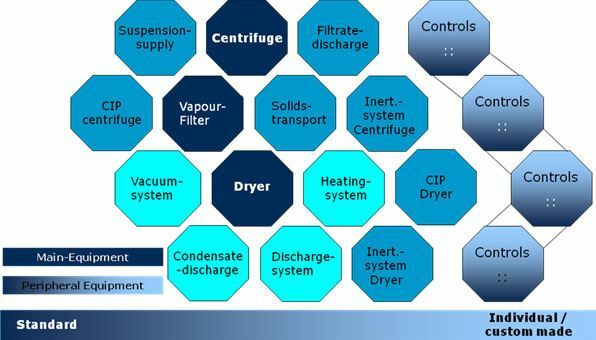 In order to ideally implement the combination of filtration and sedimentation equipment for dryers without any interfaces, the Heinkel Drying and Separation Group offers complete tailor-made solutions with all the necessary equipment from filling in the suspension to filling of the dried product. Our experts are in a position to select from our comprehensive product portfolio the best possible separating equipment combination for the respective task and supplement it through the necessary peripheral equipment thereby providing a complete solution. In doing so, our systems are based on a modular approach. Modules are available for every basic operation which, when combined, result in a unit without interfaces. The individual modules are preassembled functional units with all necessary principal components including their piping, installed valves and sensors which can be commissioned at short notice on site. The modules need only be connected to each other through fixed or flexible lines. The interaction between the individual components is monitored and controlled perfectly through our also modular full system controller. Moreover, we offer a communication option with your higher level control system. The modules with the principal components are constructed, designed, processed and fully assembled in our factory. The peripheral modules are manufactured according to our specifications by qualified partner companies. Through this flexible modular approach we are in a position to offer to our customers solutions resulting in an optimisation of the cost/benefit factor during all project stages. By relying on our long-standing experience in the field of solid/liquid separation in the chemical and pharmaceutical industry, your engineering expenses are considerably reduced. Through planning from a single source, the number of interfaces is reduced to a minimum.